The brand wanted to create a distinctive experience leading up to the 59th Annual Grammy Awards which would focus on giving back to fans. To drive sign-ups for Mastercard’s digital payment service Masterpass, the brand took over the former West Hollywood home of Tower Records to give fans a chance to get their hands on unique vinyl and experience a series of music events. The campaign, called #ThankTheFans House, was also used to engage with fans during the Grammy Awards. For nine years, Mastercard has partnered with The Recording Academy, an organization of musicians, producers, and recording professionals who host the Grammys. This year, the brand wanted to create a distinctive experience leading up to the 59th Annual Grammy Awards which would focus on giving back to fans. The campaign team settled on the idea of developing a pop-up shop which could double as a shop for fans to visit during the day and a concert venue at night. The goal was to drive awareness and sign-ups for Masterpass by leveraging it as a means for consumers to fully experience the activation. The campaign team also wanted to leverage the growing popularity of vinyl record collections. To help stock the pop-up location with classic and special edition records, Mastercard partnered with Vinyl Me, Please, an online record marketplace and record of the month club. Mastercard also wanted to create a social media promotion which would give fans a reason to engage with the brand during the Grammy Awards. The hashtag #ThankYouHouse was developed for the campaign. In terms of media outreach efforts, the campaign team targeted music, entertainment, and technology publications. 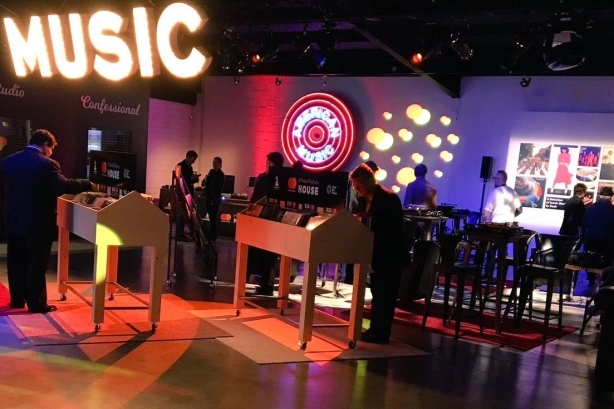 "We felt that this was a really compelling story that tapped into an exciting moment in time, the growing trend in vinyl, and how new technologies like Masterpass can unlock unique experiences," explained Cheryl Guerin, EVP, group executive, global products and solutions, Mastercard. The #ThankTheFans House pop-up location in West Hollywood was open to visitors from February 9 to February 11. During the day, visitors could play with turntables, guitars, and other music equipment, as well as check out listening stations curated by Vinyl Me, Please. Masterpass users were given exclusive opportunities, including being able to buy rare vinyl records. Record sale proceeds were donated to MusiCares Foundation, a charity that provides emergency health and services to musicians in need. "At the #ThankTheFans House, visitors had complimentary access to a branded photo opportunity that they could push through their social channels," said Guerin. At night, the pop-up location was transformed into a music venue and Mastercard users were given free access to three nights of intimate concerts. Artists featured included: Temecula Road, Kaskade, Anderson .Paak & The Free Nationals, Brandy Clark, Louie Vega, BJ The Chicago Kid, and Sofi Tukker. People who signed up for Masterpass on-site were given preferential entry to the shows. For the last night of the concert series on February 11, Mastercard partnered with music and culture outlet The Fader to host a performance by Charli XCX and a DJ set by A-Trak. On the night of the Grammys, Masterpass users were encouraged to connect with the brand on social media. Each time a different award was presented, Mastercard’s Twitter account would announce a special Masterpass promotion, including discounted movie tickets and gift cards. Thus far, campaign efforts have generated more than 259 million media impressions, measured across both social and traditional outlets. The campaign received 8,811 mentions through social conversation on Facebook and Twitter, including 663 Tower Record-specific mentions. One week following the pop-up shop and concert events, 51 original stories about the campaign had been published in outlets such as Forbes, Billboard, Heavy, Variance, and PaymentsSource. The #ThankTheFans House received nearly 2,700 total attendees and generated 314 Masterpass transactions on-site. A total of 801 vinyl records were sold at the pop-up shop, creating $8,010 in charitable donations to MusiCares.